STIR together the PHILLY, sugar, white chocolate, crushed biscuits and brandy. Briefly chill and then roll 2 teaspoonful amounts into balls, place on a paper lined tray and refrigerate until firm. MELT the extra chocolate in a MW safe plastic bowl on 50% POWER. Begin with 20 second bursts then reduce to shorter bursts as the chocolate melts, stirring well between each burst of power. Only MW until 75% of the chocolate has melted then continue stirring until smooth. USING 2 forks, coat the cheesecake balls in chocolate then allow the excess to run off, before placing back onto a freshly lined tray. 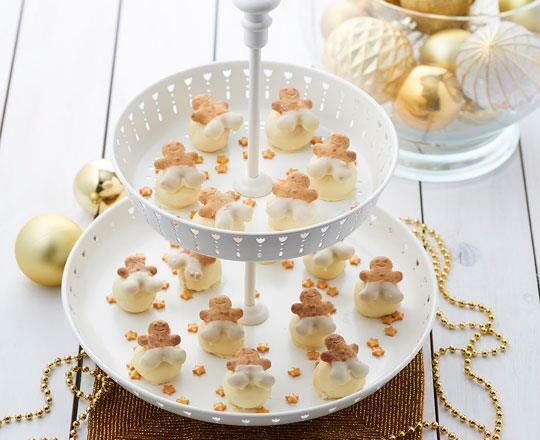 Allow to partially set at room temperature before topping each with a mini gingerbread man biscuit. Store in an airtight container and refrigerate until firm. These delicious treats are for the grown-ups. If serving to children omit the alcohol.